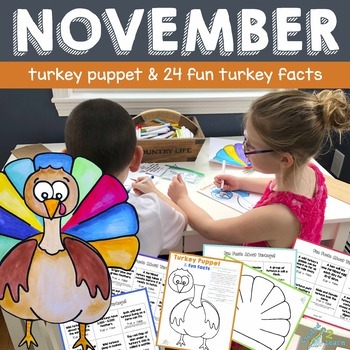 Watch this adorable turkey puppet come to life! 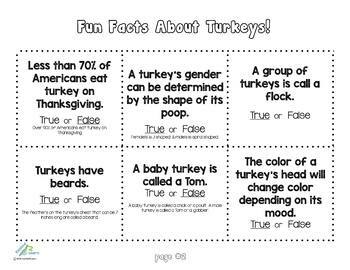 It comes with 24 fun turkey fact cards. 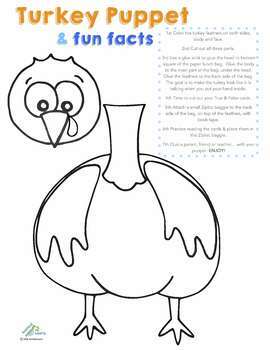 Turn this cute craft into a great learning opportunity. 1st Color the turkey feathers on both sides, body and face. 2nd Cut out all three parts. 3rd Use a glue stick to glue the head to bottom square of the paper lunch bag. Glue the body to the main part of the bag, under the head. 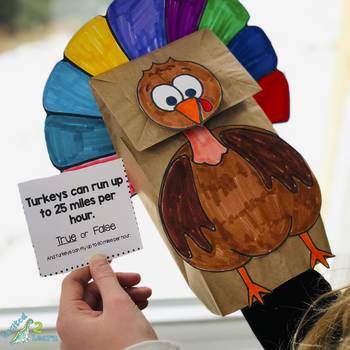 Glue the feathers to the back side of the bag. The goal is to make the turkey look like it is talking when you put your hand inside. 4th Time to cut out your True & False cards. 5th Attach a small Ziploc baggie to the back side of the bag, on top of the feathers, with book tape. 6th Practice reading the cards & place them in the Ziploc baggie. 7th Quiz a parent, friend or teacher,…with your puppet. ENJOY! Be the first to know about new freebies, discounts and products by following my store. Simply click on the star near the top of my page that says, “follow”. I also love to get product reviews :) and feedback. Please let me know if there is an additional activity you wish I had included. All images and clip art in this resource were created by me. This product is for your own personal use. You may print, copy and change it for use in your own classroom or home. If you think a colleague or friend would like it, please send them to my TPT page. Copying or changing and using for commercial purposes is strictly forbidden without written permission from Excited2Learn. Copying any of this product and placing on the internet in any form is strictly forbidden and will be in violation of the digital Millennium copyright Act (DMCA).